Allright, folks. This series is all about Thanksgiving. For the next 8 days, you’ll get my recipes for great Thanksgiving food, my tips for all your cooking questions, and a little bit of guidance on ensuring everything runs smoothly so you can enjoy this holiday season with your friends and family effortlessly. Today’s post is really an overview. I have to admit, I’ve only had one traditional Thanksgiving dinner my entire life. That was last year – if you check out the picture above, that was the first turkey I’ve ever made (and thankfully, it was delicious)! I grew up in a traditional Indian household, which is mostly vegetarian. So whenever the family got together, we just always ate the Indian food you eat during holidays. This meal is never seasonal – usually some combination of rice, lentils, potatoes, and sweets – so we have it during Diwali, Thanksgiving, Christmas, New Years, Birthdays, religious holidays, etc. It’s good…but my sister, Zarna and I really wanted to have a traditional Thanksgiving. And so the idea was born. The family had all decided to meet for Christmas, since with school/work it was going to be hard to come together for Turkey day. We invited all of our Nashville friends with one stipulation – we’ll do all the cooking, you all bring the wine! It was a hectic few days, filled with cooking, but paid off as almost everyone who came said “that was just the best meal I’ve ever had.” It was a great time for us to share, to give thanks, and enjoy a great meal and some equally great wine! So, here’s the plan this week and some parts of it are going to require your involvement, so please leave some comments. I’ll answer them the day you post, but on the Tuesday before Thanksgiving, I can create a top 10 of the most asked questions to serve as a guide for you in the final days. So please leave some comments, we’ll get through Thanksgiving and you’ll look like a pro. Tuesday: The Turkey. I’ll give my technique (brining) and what flavors I use (chile butter, sage) and how I cook it. This is a delicious, moist turkey. You’ll love it. Wednesday: The Dressing. Note that I said dressing and not stuffing. Mine is a cornbread dressing, with lots of roasted wild mushrooms and copious amounts of goat cheese. Thursday: The Sides. Mashed Potatoes. The best you’ve ever had. Friday: The Sides, Part II. Roasted Sweet Potatoes and Bananas with a Praline crust. A great way to have sweet potatoes! Saturday: Desert. It’s gotta be pumpkin pie. But the garnish makes this very special. Sunday: The Sauce: Turkey Sage and Black Pepper Gravy. No lumps, no fuss, awesome sauce. Monday: The Sauce, Part II: Cranberry and Roasted Jalapeño Sauce. This is a bit sweet and carries some heat. Tuesday: Putting it all together. I will take all the questions you guys have posted in comments, and do a “top 10” of the most asked questions, so this can be a great resource for you as you plan Thanksgiving. Wednesday: The Drinks. What wines go well with turkey. Maybe even a cocktail recipe! 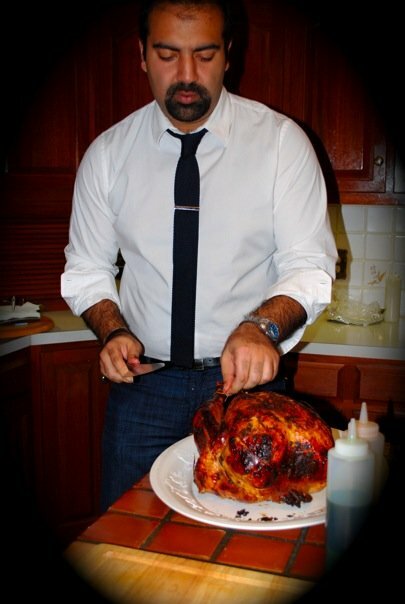 Let’s get started then – it’s Thanksgiving time on Vivek’s Epicurean Adventures! I can’t wait to read how u make all this, it all sounds delectable!!! I’m especially looking forward to how u make the turkey and gravy of course. Turkey recipe is up tomorrow. And the gravy is divine, if I do say so myself! I’m so excited for these recipes!! Last year was soo good. I hear you are gonna be in town after all. Repeat?? I’ll help! We will! My mom was talking about everyone being hosted at Bini Aunties this year. You going? Don’t think so…I don’t think she’s gonna have thanksgiving food :-(. Renita and I were thinking maybe we can do a potluck, since you worked so hard last year. Maybe each of us can try making one of your recipes…might be a disaster haha. I’m very intrigued by this “dressing” (though as a yankee transplanted in the south it kills me to say dressing instead of stuffing.) Love mushrooms and LOVE, LOVE goat cheese. Sounds divine. Haha – very clear distinction here in the South. Some people like to stuff, but I gotta say I prefer dressing. And it’s a lot simpler to make. Hope you enjoy the dressing recipe on Wednesday! It’s really great.